Learn a few digital camera basics. What is a pixel, anyway? What information does it store? How many megapixels do you need? Learn about RGB, CMYK, color depth and resolution. What are pixels? The word “pixel” means a picture element. 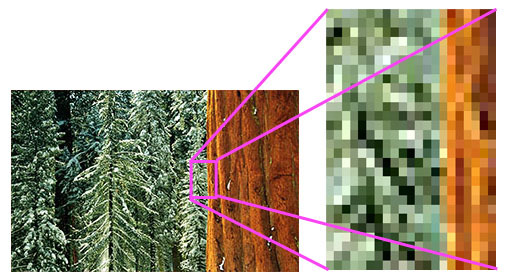 Every photograph, in digital form, is made up of pixels. They are the smallest unit of information that makes up a picture. Usually round or square, they are typically arranged in a 2-dimensional grid. In the image below, one portion has been magnified many times over so that you can see its individual composition in pixels. As you can see, the pixels approximate the actual image. The more pixels you have, the more closely the image resembles the original. The number of pixels in an image is sometimes called the resolution, even though this is a bit of a misuse of the term. If we are using the term to describe pixel count, one convention is to express resolution as the width by the height, for example a monitor resolution of 1280×1024. This means there are 1280 pixels from one side to the other, and 1024 from top to bottom. Another convention is to express the number of pixels as a single number, like a 5 megapixel camera (a megapixel is a million pixels). This means the pixels along the width multiplied by the pixels along the height of the image taken by the camera equals 5 million pixels. In the case of our 1280×1024 monitors, it could also be expressed as 1280 x 1024 = 1,310,720, or 1.31 megapixels. So, How Many Pixels Do I Need? Now that we’ve answered the question “What is a Pixel?” let’s examine how many of them you need in your image. Image resolution describes the amount of detail that an image contains. The term can be applied to digital images, film images, and prints. The bottom line is that higher resolution means more image detail. Camera manufacturers are always trying to sell you on the number of megapixels. The fact is, from a strictly megapixel point of view, most camera phones have “enough” for the average home user. There is software available to help you increase the resolution of your images artificially. It uses an interpolation algorithm which essentially fills in extra pixels with a “best guess” at the right color. Genuine Fractals by onOne Software is an excellent example of such software. For excellent quality prints, you’d ideally like a minimum of 240 pixels per inch in each dimension. This means for a 4″x6″ print, you need 240×4 pixels in the width, and 240 x 6 pixels in the height. That’s 960px wide x 1440px high. Multiplied together, that’s 1,382,400 pixels, or approximately 1.4 megapixels. By the same token, to make decent 8″x10″ print, you’d need a 4.6 megapixel camera. Keep in mind that for a point and shoot camera, beyond a certain point (probably around 4 to 5 megapixels), more megapixels will not necessarily yield a better image. Other issues, like lack of overall image sharpness due to poor image or lens quality, or poor lighting, will limit the usefulness of more megapixels. In a DSLR, however, more megapixels give you the flexibility to enlarge your images more, and also crop out sections of them, while retaining reasonable resolution for printing. Make sure you’re maximizing your megapixels! Digital cameras have a “quality” setting that changes how many pixels they actually record. Unless you have your quality setting on the highest level, you are not taking full advantage of your camera’s recording capabilities. Small (640 x 480 pixels) — .3 megapixels — really low resolution! What is a pixel used for? Each pixel stores color information for your image. It will usually store it in either 3 components, known as RGB (Red, Green, Blue), or 4 components, known as CMYK (Cyan, Magenta, Yellow, blacK). The number of distinct colors that can be represented by a pixel depends on the amount of information stored for each pixel. Information is stored as bits. the more bits per pixel (bpp) that are stored, the more colors a pixel can represent. For example, in the simplest case, if only a single bit of information is stored for a pixel, then it can be “on” or “off” — black or white. The actual number of bits used to represent the color of a single pixel is known as color depth, or bit depth. Next, you may want to visit another digital camera basics page to learn about digital sensors. Best Books on Digital Photography?